Clothing your walls with a wallpaper beat a paint job in many aspects. With the right choice, wallpaper can bring in the oomph to your home makeover. There’s just plenty of colors, patterns, and textures to choose from. Plus, you can get it installed in just a day or even only a few hours. Compared to painting the walls, hanging wallpaper is an easy task. All you need is the right wallpapering tools and the know-how to using them correctly. If the wallpaper that you are going to be hanging is not pre-pasted, then you will have to apply the paste by yourself. While some homeowners try to use a regular paintbrush for the job and may be able to hang their wallpaper without too many problems, using a dedicated paste brush is a much better idea. These brushes have more bristles to ensure that you have a nice thick surface when you are brushing paste on your wallpaper. Additionally, the bristles are really soft, so they bend and move with you while you work. This not only makes the brush easier to use, but it also ensures that you don’t damage the wallpaper on accident. Also known as a “pasting table”, these tables are higher than the traditional dining room or kitchen table, which means that you’ll be able to easily apply paste to your wallpaper without having to bend over and be in an uncomfortable position for a long period of time. They are also wider than a standard wallpaper roll, so there isn’t any overhang that you will have to deal with in the future. Because these tables are folding and incredibly lightweight, you can easily move them to any location in your home when you are working. There are a few different styles of wallpaper tables to choose from. The ones with w-legs are significantly more sturdy than less expensive versions. Plastic wallpaper tables are not only easy to clean and to store, but they tend to be very sturdy, as well. Ensuring that your wallpaper is hung level is important so that you get the best finished appearance in your room. Eyeballing whether or not the top of the wallpaper is level is almost impossible, which is why it’s such a good idea to go ahead and invest in a level. While there are many different types of levels available, you will want to make sure that you buy one that is long enough to make it easy for you to see how level your paper is. Smaller levels may seem like they will be easier to use and to store, but they can actually make it more difficult to complete your wallpapering job, so opting for a longer level is a good idea. A plumb line is necessary if you want to make sure that you are going to be able to hang your wallpaper completely straight and not have any variation in it. Trying to eyeball the wall and get the wallpaper straight in that way is a bad idea and can result in your wallpaper being angled. 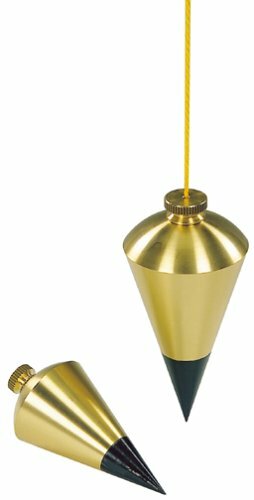 It’s best to use a plumb when you want to make sure that you have perfectly straight vertical lines on your wall for hanging your wallpaper. These rely on a weight hung on the end of a string to pull the string straight towards the ground for a line. A chalk line is very similar to a plumb line but does vary somewhat. Not only can a chalk line be used to create perfect vertical lines, but it can be used for lines in any direction. While this may not be necessary for your wallpaper job, it does mean that you will have invested in a tool that has multiple uses. They consist of a box filled with loose chalk powder and a long line of string. When you pull the string out of the box, it will be covered with this fine chalk powder. You can then line it up where you want your line to be drawn and then snap it gently against the wall or other surface, leaving behind a perfectly straight line of chalk that is easy for you to see and to follow. Generally used only when you are going to be removing wallpaper that you don’t want on your walls anymore, if you have made a mistake when hanging your wallpaper, you will need to use a scorer to make removing it as fast and easy as possible, or it is easy to become frustrated. Rather than trying to pull down wallpaper that is already attached to the wall and risking damage or trying to score the paper with a knife, when you use the correct tool for the job, you will find that this is much easier. These scorers have very sharp blades underneath that will cut the wallpaper on your wall into tiny pieces. By holding the scorer tool on the top and running it over the wallpaper, you will be able to make multiple holes in the paper so that your stripper, steam, or hot water will be able to penetrate. As long as you do not run the tool over your skin, then there isn’t any concern of you getting injured on accident. A paper-hanging brush is imperative if you are going to try to get the smoothest finish possible when hanging wallpaper. These brushes have incredibly soft bristles that will make it very easy to smooth out any air bubbles that may be hiding behind the paper, as well as any extra paste that will otherwise leave a lump. It’s important to make sure that you care for your smoothing brush and wash it in warm water each time you are finished using it so that you can ensure that it will stay pliable and fresh in between uses. 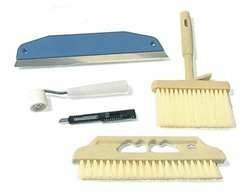 If you do want have to worry about caring for a brush or are unable to find one that will work for your needs, then you can easily buy a plastic tool that offers the same use. A smoothing tool comes with angled edges that make it very easy to get into corners of your room so that you don’t need to worry about any bumps anywhere on your walls. This is a small roller that looks very similar to ones that are used for painting except for the fact that it is significantly smaller in size and has a firmer surface. These rollers are used to ensure that the seams between your wallpaper are pressed down correctly and therefore not visible. If you do not use a seam roller, then you risk having the seams peel apart and show over time. Using a seam roller is very easy and only involves you gently pressing the seam roller onto the wall while rolling it up and down the seams. If there is excess paste that squeezes out of the seams when you do this, then you will want to wipe that away on a regular basis so that your roller doesn’t become gunky. Paste that drives to the surface of your roller will also cause it to have problems rolling evenly and creating a smooth and flat surface. When using a seam roller it’s fine to use it on regular wallpaper, but if you have anything particularly fragile or embossed, then you will want to skip using this tool as it can cause some damage when you are not careful. Getting wallpaper off of the walls can be very difficult at best, but having the right tools will make it much easier, no matter how much wallpaper you are going to have to remove. Using a scraper is a great way to help remove large areas of wallpaper quickly without worrying about damaging the walls. Look for one that is made of metal so that you won’t have to worry about whether or not it will be sturdy enough to stand up to the work that you are going to do. Also, if you want to be able to use this tool again in the future, then you will want to buy one that has replacement blades included so that you can easily swap them out when your current blades begin to dull. Doing this will also increase your productivity and decrease the likelihood that you will make a mistake and hurt your wall because you were trying to force a dull blade through the wallpaper. Without a tape measure, you will find it very difficult to correctly and accurately measure the amount of wallpaper that you are going to need to finish your room. While some homeowners do try to use a ruler or a yardstick for this job, using a tape measure will make it much faster and easier. Additionally, since tape measures come with a number of features, you can easily find one that you can use by yourself, if necessary, which will speed up the process as well. Putty knives are for more than simply working putty around windows that you are installing. It is also a very simple tool that will make dry-stripping your wallpaper incredibly fast and easy. If you are lucky enough to not have to wet your wallpaper to remove it, then you will be able to get away with simply using a putty knife to strip it off of the walls. Sometimes this means that you can remove long strips or full sheets of wallpaper in a single pass. Make sure that you are careful when choosing your putty knife for this purpose; you do not want to purchase one that has very sharp corners, as they can easily damage your wall. Either opt for putty knives that are made of a sturdy and durable plastic or sand down the corners of a metal putty knife to get the tool that you need without risking damage. Because these tools have a number of other purposes, such as filling in cracks or divots in the wall with putty, they are handy to have around the home. If your wallpaper is really stuck on tight and you can’t get it off, even when you use a putty knife and a scraper then you will want to invest in a wallpaper steamer. While these are a more expensive option than other tools that you can use to remove your wallpaper, they will make it much easier to remove even the most stubborn wallpaper from your walls. They work by steaming small sections of the wallpaper at a time, which will loosen the glue and make it easy to remove the paper from the walls. Look for a steamer that is easy for you to use on your own so that you can remove your wallpaper without the help of another person, and you should find one that will steam a large area at once. This will decrease the amount of time that you will have to spend removing your wallpaper. Hanging pre-pasted wallpaper seems like it should be easy, but without the right tools, you will find that you will struggle. No matter how careful you are when wetting the wallpaper, if you are not prepared with a wallpaper prep tray, then you are likely to make a mess or have wallpaper that is not evenly damp. This means that your wallpaper will not hang correctly and that you will have problems with bubbles and wrinkles. A wallpaper prep tray will hold the water that you need to dampen your paper and prevent you from making a mess. One of the benefits of using these trays is that they are wide enough to easily accommodate your paper so that you don’t have to worry about how you will get the whole piece wet at once. A utility knife or a box cutter is handy to have when you are going to be hanging wallpaper, as you will want to use this tool to cut your wallpaper at the ceiling and along the floor or the baseboard. Rather than trying to make this cut with scissors, which can be difficult to do and end up with an uneven line, when you use a utility knife you will be able to work quickly and cut through the paper purposefully so that there is not a jagged edge. One benefit of working with a box cutter is that they generally have multiple blades that you can break off when they become dull, allowing you to use a sharp blade each time you make a cut. 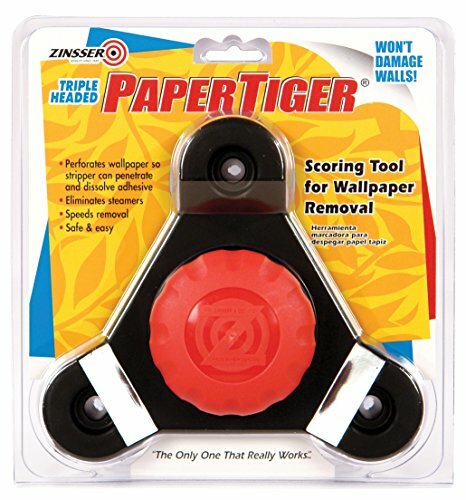 This is important and will keep your blade from catching and tearing the wallpaper when you are cutting, which may cause you to have to redo your work. If you want to try to use hot water to remove your wallpaper, then using a spray bottle is a great way to apply it to the wallpaper. Make sure that you opt for one that will be easy for you to hold and to squeeze multiple times, as you are going to have to squeeze the pump repeatedly to be able to release enough hot water onto the wallpaper to help loosen up the glue. If you are worried about whether or not your hands will get too tired doing this, then it is a good idea to opt for a pump spray bottle. This will let you fill the bottle with hot water and then pump it up to build pressure inside. Then, when you spray the water onto the wall, it will release automatically, thanks to the pressure, and you will not have to squeeze the pump repeatedly. While a sponge certainly isn’t the most high-tech tool that you will need for wallpapering, they are imperative when you want to ensure that the paper is fully saturated and that the glue will easily release from the wall during removal. A large sponge makes it easy to keep drips from running down the wall and pooling on the floor or along the baseboard, no matter if you are working with water or a wallpaper stripper. While some people think that they can use a typical sponge for this task, it’s best to use a larger one designed for this work as it will do a great job holding water. To ensure that you have a straight edge when you cut the top and bottom of your wallpaper with your box cutter or utility knife you will want to run the blade along a straight edge. These are rather lightweight and make it easy to control where the blade is going to go so that you do not make a mistake when trimming your paper. When you are first getting started installing or removing wallpaper then it can be very daunting to make sure that you have all of the tools that you will need for the job, which is why it’s a good idea to buy everything that you need in a kit. Rather than trying to buy individual tools and hoping that they will work, when you buy a kit you will be able to have confidence that you have everything you need for the task. Buying quality kits will ensure that all of the tools you purchase are higher quality and that they have been built to last, so make sure that you choose a kit that is made by a reputable company before spending any money. It is completely normal, although painful, to experience pain when you are gripping tools for long periods of time. Removing your wallpaper or installing it is generally not a very speedy process, and to ensure that you do not have to deal with a lot of pain in your hands, wrists, or fingers, it’s a good idea to opt for ergonomic tools. These tools will make it very easy for you to grip them for extended periods of time without having to worry about whether or not your hands are going to hurt or going to cramp while you are working or at the end of the day. 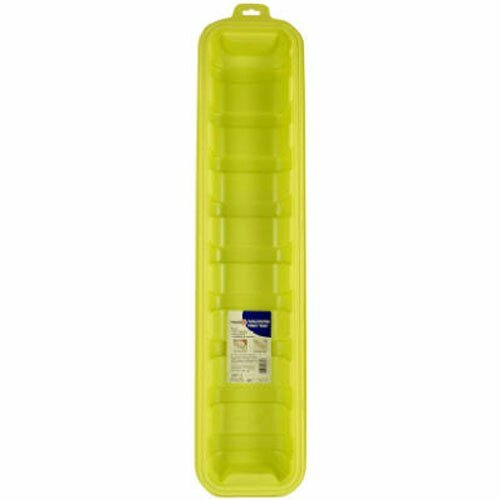 They generally have rubber handles that are much easier for people to hold on to and have been formed in a way that will be comfortable to hold. While many people are perfectly happy using a plumb line or a chalk line to ensure that they have straight lines to follow when hanging wallpaper, if you are comfortable with more advanced technology and want to make sure that there is no room for error when hanging your paper, then you will want to consider a laser line. These are fairly easy to install and allow you to direct a laser exactly where you need it to go to ensure that you will have straight lines that are easy to follow. Additionally, the laser can’t rub off the way that a chalk line accidentally can. Scrapers are great for removing wallpaper quickly, but if you really want to speed up the process and ensure that you have a lot of control over the movement of your scraper, then you will want to look for one that has a roller on the other end. 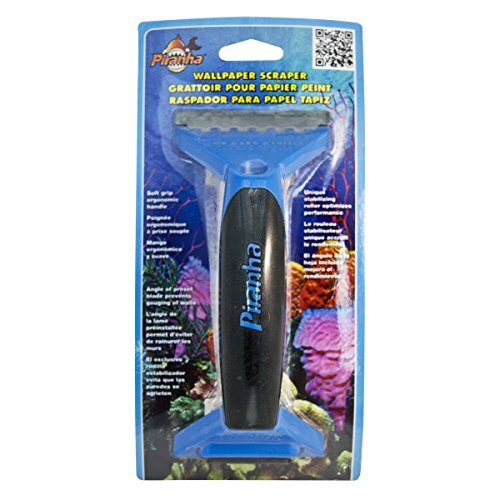 This allows you to press down hard on the scraper so that the blade can easily remove as much paper as possible, and the roller allows for free and easy movement. 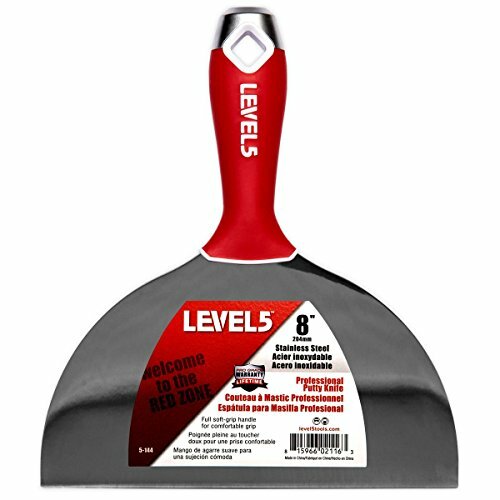 Since you won’t be fighting against friction when using a scraper that has a roller you will likely find that you can quickly and easily remove more paper than you ever thought possible.